The Cat and the Coup tells the story of Dr. Mohammad Mossadegh, the first democratically elected Prime Minister of Iran. More specifically, the game presents events from Mossadegh’s life in reverse-chronological order, beginning on his death bed following the CIA-sponsored coup d’etat in 1953. The coup was brought about by Mossadegh’s decision to nationalize Iran’s oil fields – an event I wasn’t aware of until playing the game. The game’s historical events play out in a way that takes the player back in time to the moment he was elected Prime Minister. In another unusual twist, you don’t play the game as Mossadegh, himself. Players instead control the Prime Minister’s cat. As his cat, you’ll solve these puzzles via cat-like activities such as jumping around, knocking stuff off of shelves, and scratching. Each “stage” of The Cat and the Coup is presented as a puzzle that also serves as an artistic representation of key moments in Mossadegh’s life. Brief snippets of informative text are woven into the backgrounds, which helps to keep the player aware of the tale’s chronology and milestones. The look of the game is gorgeous, giving you the feeling that you’re navigating a giant historical tapestry. 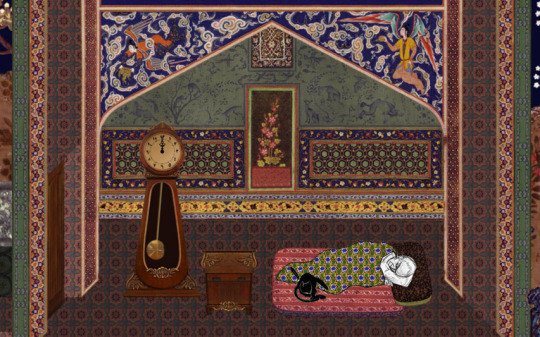 The Persian Miniature art-style also has some touches of collage-style madness. Some of the art seems like it could have been ripped from Terry Gilliam’s subconscious, circa Monty Python’s Flying Circus. As odd as it may sound, the disparate art-styles really enhance the uneasy mood of the game. I've been thinking lately of how a Midan Tahrir: The Revolutionary Board Game might work out. Perhaps an iPad version would work!